The heat shrink pack has a selection of sizes ideal for most assembly needs from lipo packs to bullet connectors on motors. 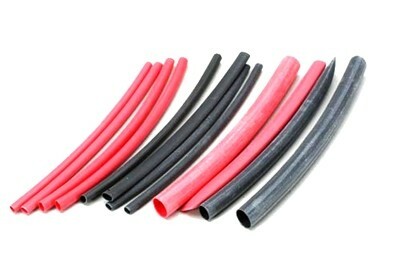 There are 12 tubes in total in this heat shrink pack, 6 of black and 6 of red. An assortment of sleeve sizes for the popular wire gauges. customer service is very bad. Took 4 days to answer an email. I send at least 4 emails. Took them 4 days to mark item from processing to shipped. Hello Michael, thank you for your review / comment, I have checked our correspondence logs and there was a 2 day delay in returning your emails as it was a weekend, however we did reply on the Monday to your requests for information on the status of your order, the order was shipped on the day the order was placed in the store, and for some reason the store did not update the information correctly to reflect this and did not send you a conformation email, please accept my apologies for this issue on the order shipped notification, the shipping information was updated on the Monday after we had read and replied to your emails from the weekend. If you need any other assistance or have any more questions please let me know.